Graham Cracker Comics can be found throughout Illinois. (There are about 9) The location I’ve been to is in the Loop at 77 East Madison Street. They sell nerdy t-shirts, figurines and action figures, games, buttons, mugs, collectible cards, and of course comics, both well known and independent and local. The shop is shaped a bit like a U and the back comics are at the end of the right hand side, as well as some of the cheaper comics. They participate in free comic book day. I attended free comic book day there this year and was a bit disappointed, having been spoiled back home for free comic book day by the local stores that would give out goody bags full of stuff color coded based on age and another shop that had a ton of extra promo stuff from whatever recent movie had just come out. 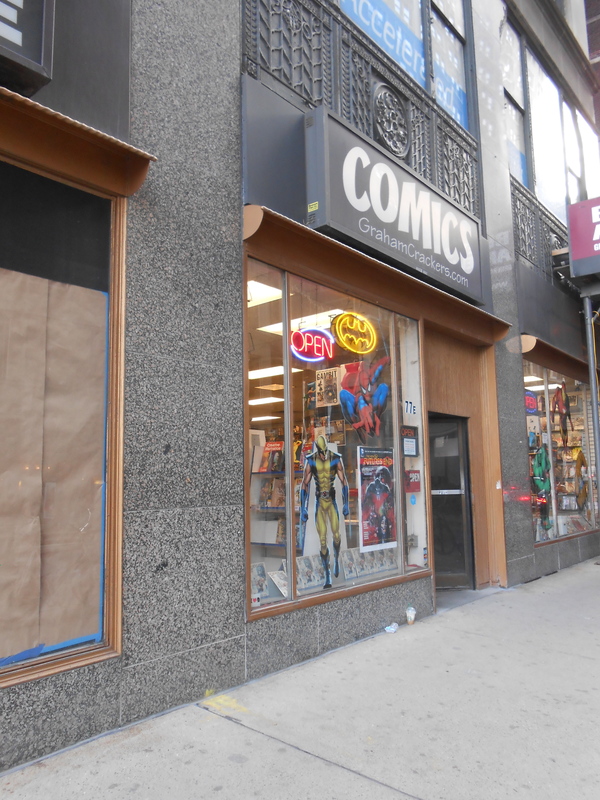 (Though as a note both places catered towards a smaller city/town rather than a city the size of Chicago) The Loop location is the only one I’ve been to for free comic book day, usually because of my schedule and this year I barely made it to this one because I was in class the entire day. They put everything on the back shelf with a worker watching over it and it drew a crowd. Everyone was allowed three comics which worked fine, it was just hard to see what all was there and then once I made a decision hard to get to the comics because of the crowd. The Loop location hosts a Ladies Night for the first Wednesday of the month from 6-8pm. They sometimes end early so that people can chat. People bring the comics they’re reading or creating and talk about them or give each other suggestions and if you’re a lady you get a 10% discount that night. I’ve gone once and due to other responsibilities couldn’t stay long. It’s off in a corner by the back issues and rather packed and cramped. They create a circle for discussion and people get there early to grab a seat but show up throughout the night to stand around and join in, or people sit in the center. There is a woman in charge but when I went she had to deal with other things and would leave often. While she was gone another woman would talk an ask questions. They have a pretty established community and a good group of usuals. They talk about representation in comics as well as what they may have gone to or are working on or reading and why they liked it or didn’t. It’s very much a discussion group, but I think it’s also a great place to get comic recommendations or meet new people. I didn’t participate and didn’t stay too long, I also happened to pick a busy night where they had two film crews in the shop. One for a documentary and one for an award nomination video for some judges. So it was pretty cramped, probably more so than usual.